Mix your passion for music with your love of traveling at the Savannah Music Festival. Discover one of the most charming cities in the South and see your favorites artists live during an exclusive weekend! This festival is one of the most anticipated events of the year, so come and celebrate the arts during your stay at Presidents’ Quarters Inn. Start planning your getaway by accessing our complimentary Vacation Guide! The Savannah Music Festival has hosted several world-class artists from all around the globe since 1989. Every spring, the city awakens to the beautiful sounds of high-quality performances that draw thousands of visitors each year. With more than 500 artists, it’s considered the biggest festival in Georgia! The lineup includes a wide variety of genres, so there’s something for everyone. When Is the Savannah Music Festival? The Savannah Music Festival usually runs from the end of March to the beginning of April. The musical performances are spread out over about two weeks, so you can choose when to book your stay at Presidents’ Quarters Inn based on the performances you would like to see. Tickets to the Savannah Music Festival are easy to get! Purchase your tickets online when you browse through the lineup, by phone through the Savannah Box Office at (912) 525-5050, or in person at the Savannah Box Office. Local tip: There are ticket deals and bundles available! This is a great way to see tons of amazing music. Bundles have been put together based on certain timing and genres; for example, you can buy a ticket bundle for an entire weekend. These bundles give you tickets to multiple events at a discounted price! Who Is Playing at the Savannah Music Festival? The Savannah Music Festival is comprised of more than 500 musicians from around the world! Every genre is represented, so there is something for everyone. From jazz to bluegrass, the eclectic mix gives you a taste of some of the best artists in the industry. Where Is the Savannah Music Festival Held? One of the many reasons why the Savannah Music Festival is unique is because it is spread throughout the city. The festival takes place in many venues around downtown. Some favorites include Trustee’s Theater, the Lucas Theater, the Ships of Sea Maritime Museums, Rousakis Plaza, Johnny Mercer Theater, the Yamaha Center for Performing Arts, and the beautiful Trustee’s Garden. They’re all just moments away from Presidents’ Quarters Inn! 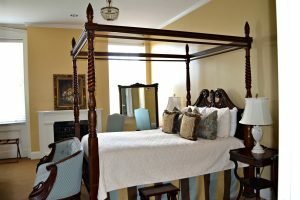 Check this year’s dates for the Savannah Music Festival, then book your stay at Presidents’ Quarters Inn! Our inn is just moments away from the venues of the festival, so you’ll have easy access to all the events you want to attend. With complimentary first come, first served parking and a delicious breakfast each morning, our inn has everything you need to make your getaway perfect. Browse our accommodations to start planning your stay! Our inn gets booked quickly for events, so make sure you reserve your stay before it’s too late.